I purchase 8x10 self-sealing acid free bags (100 per package), 8x10 boards (5 per package) and self-sealing cardboard mailing envelopes. I purchase the acid free pen, the acid free bags and the boards from a local art store or you can purchase everything online. The cardboard mailing envelopes are from a local business supply store. When you have all the supplies, it is a very fast process to package and ship your photographs. 1. I sign my photograph. All my photographs are printed from a commercial photography lab as I don't print them out myself. 2. 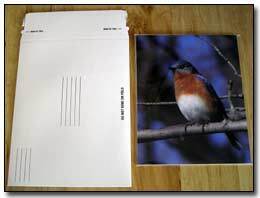 If the photograph is purchased from me online, I print the invoice. 3. I cut and paste the shipping address into a label form that I have created in Word. The label matches the priority labels you can pick up for free at the Post Office. I print out the label and cut off the top of the priority label and attach it to the cardboard envelope. 4. After 2 minutes, the signature is dry and I place the photo onto a 8x10 mat board and into the acid free bag. The bag is self-sealing. 5. I place my photography label on to the back of the bag. 6. I write a little thank you on the invoice. 7. I place the photo into the cardboard envelope with the invoice included. The cardboard envelope is also self-sealing. 8. I mail the envelope. When you have a system in place, the whole process takes about 3-4 minutes (not including printing your own prints). The post office has a lot of different size boxes that you can get for free. Your local post office only has a few of the selection. Go on line and you can order whatever you need and the boxes will be delivered to your house. The post office also has a service that you can print out your own labels and postage. If I am shipping more than 1 print at a time to a single person, it is better to use priority mail and place the prints that are packaged with the acid free bags and the mats into the priority mail envelope (and you don't have to use the mailing cardboard envelope. Just make sure that you place the prints facing each other inside the priority envelope. It is actually less expensive than using 2 or more cardboard envelopes and the postage. The whole packaging and postage for an 8x10 print adds up to about $3.00. I hope this has helped you to package and ship photographs.